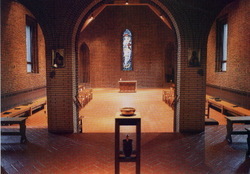 Entering into contemplative prayer is like entering into the Eucharistic liturgy: we "gather up:" the heart, recollect our whole being under the prompting of the Holy Spirit, abide in the dwelling place of the Lord which we are, awaken our faith in order to enter into the presence of him who awaits us. We let our masks fall and turn our hearts back to the Lord who loves us, so as to hand ourselves over to him as an offering to be purified and transformed. No registration needed just come and join us. Join us every Tuesday from 8:30 am to 10:30 am at the conference room; NO cost, NO registration.